Published in the South Kent Gazette, 11 April 1979. The Dover Corporation, under the title of the Mayor and. Commonalty, retained its ancient privileges, without much variation, down to the time of the Tudors. Previously, the whole body of the free burgesses had, from time to time, been assembled by the blowing of the Burgh-mote Horn, but, in the reign of Queen Mary, a common council, consisting of thirty-six members, selected from the commonalty, together with twelve jurats (of whom the Mayor was one), became the executive body, to whom the entire government of the town was entrusted, with the exceptions that the whole body of the burgesses had a voice in the annual election of the Mayor and in choosing two burgesses to represent them in Parliament. Soon after the Dover Corporation had attained the fullest extent of its powers, a process of devolution commenced. THE TOWN AND PORT UNITED. Prom the earliest times the Town and Port had been united under the Corporation’s control. The 21 wards of the town furnished the 21 ships which this port provided for the King’s service, and, as a reward for that service, the Corporation held for the King, and leased to the burgesses, all the town lands; and those 21 ships also shared the profits of the passage to France — a monopoly secured to the Corporation by a Royal Ordinance before the Norman Conquest. While the harbour remained in the eastern part of the Bay, the complete union of town and part was uninterrupted; but when the new western harbour was formed, Royal aid entailed Royal control. Money was largely granted for harbour works by the Crown and by Parliament, in the reigns of Henry VIII and Queen Elizabeth, the expenditure of that money being entrusted to temporary Royal Commissions; and, eventually, at the beginning of the reign of James 1, a permanent body of Harbour Commissioners was appointed by Royal Charter; and the port, since that time, has been continuously under separate jurisdiction. The creation of the Dover Paving Commission in 1778, to watch, light, and pave the town, was another important devolution of the Corporation’s authority, which, however, was not permanent. The Commissioners were empowered by four Acts of Parliament, passed in the years 1778, 1810, 1830, and 1835. The Act, therefore, provided for "better cleansing, lighting and watching the streets and lanes in the parishes of St. Mary and St. James the Apostle;“ that Act also providing that the Commissioners to administer it should be (1) the Mayor and Jurats of Dover; (2) the Members of Parliament for the same; (3) the Recorder and common council men; and (4) 49 inhabitants, who were named in the Act. Members to fill vacancies as they arose were elected by the Commissioners. The roads and pavements were vested in the Commissioners, who were empowered to take stones and shingle from the beach for paving; to fix and light street lamps; to appoint watchmen, not exceeding 24, to patrol and guard the streets (in lieu of the personal duty of watch and ward, which hitherto had been obligatory); and, for revenue, the Commissioners were empowered to levy (1) road tolls, (2) coal dues, and (3) a rate of not more than 6d. in the pound on property, with the addition of borrowing powers to the extent of £8,000. The Act passed in the year 1810 gave further powers, including an increase of the coal dues, and authority to borrow £11,000 beyond that allowed by the previous Act, as well as special powers to take property in St. James's Street, Bench Street, and other places for street widening, and to extend the operations of the Commissioners in certain cases to Charlton and Hougham parishes. The preamble of the Act of 1830 states that "the population has considerably increased since the passing of the previous Acts, and the town has become a great resort for strangers and visitors,“ and that further powers were required. In addition to giving extended sanitary authority, permission to borrow was increased up to a total of £29,000 (including previous loans), and the constitution of the Commission was fundamentally altered, introducing the principle of election by the ratepayers. The Act provided that the Mayor, Recorder, and Jurats were to be ex-officio members; it also nominated 55 inhabitants as members, and directed that the ratepayers should elect 50 more, making a total of 118; and that thereafter one-third of the members (35) should retire by rotation annually (excepting the Mayor, Jurats, and Recorder), and that number be annually elected by the ratepayers. The fourth Paving Act, obtained in 1835, was mainly for the widening of Bench Street and the opening of Castle Street, the corresponding widening of King Street having been carried out under the Market Act of 1826. The principle of electing the Paving Commissioners, in 1830, by the ratepayers, was extended to the election of the Town Council by the Municipal Corporations Act of 1835, in both cases the privileges of the Freemen, as such, being ignored in local government. After the passing of the Public Health Act of 1848, the Board of Paving Commissioners was dissolved, the whole of the civil government of the town being then restored to the Corporation. The judicial powers of the Corporations have also, from time to time, been curtailed by devolution. Primarily, the Mayor and Bailiff, and their predecessors under other names, had great authority, but later Jurats were appointed to assist the Mayor in the Court of Record. In the Court of Quarter Sessions, the Mayor in the Court of Record. In the Court of Quarter Sessions, the Mayor sat as Judge. After the passing of the Municipal Corporations Act of 1835, the trial of capital offenders was transferred to the County Assizes, and, from that time, the Recorder presided at the Borough Quarter Sessions instead of the Mayor. 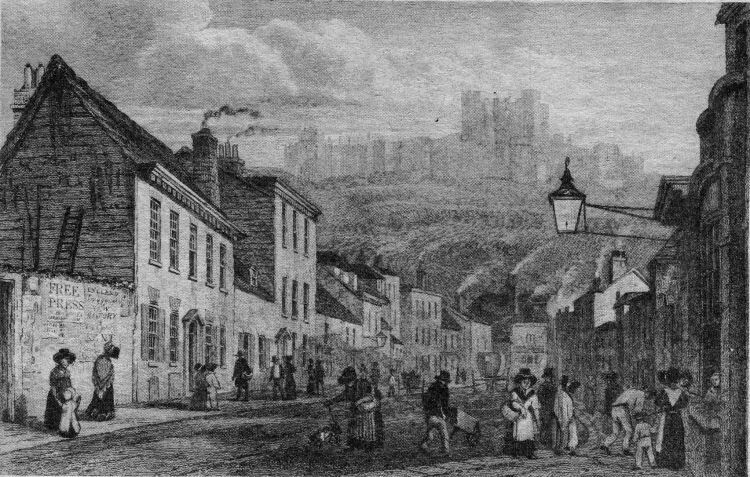 A George Shepherd print of 1829 depicting a busy scene in St. James’ Street, once one of Dover’s busiest thoroughfares — before Castle Street was opened up to the Market Square—and now practically non-existent. Screaming from a poster on the left is the slogan Free Press, a reminder that our news used to be taxed. The wall there and the handsome double-fronted house next door — which had a 1759 date stone—were demolished to build the old St. James’ church hall. The house was the home of stonemason James Jarvist.